Plans by Italian Prime Minister Silvio Berlusconi’s allies to prosecute Muslim women for wearing burqa, a loose outfit covering the whole body from head to toe, is infuriating the political establishment in the southern European country. "A ban (on the burqa) would be xenophobic and discriminatory,” Mario Scialoja, the chair of the Islamic Culture Center of Italy, told Reuters late Thursday, October 8. “The existing law should be enforced." The far-right Northern League is pressing to amend a 1975 law to prosecute Muslim women for wearing burqa. The law slaps hefty fines and up to two years in jail on people covering their faces with anything preventing their identification by police. But the Northern League is now proposing to amend the law to ban “garments worn for reasons of religious affiliation”. The far-right party also wants to remove from the law the expression “justified cause”, which has prompted courts to allow burqa on religious grounds. Scialoja warned that a burqa ban would stigmatise Muslims, calling on Italian authorities to treat Muslim women with respect. "We say no to a new law." 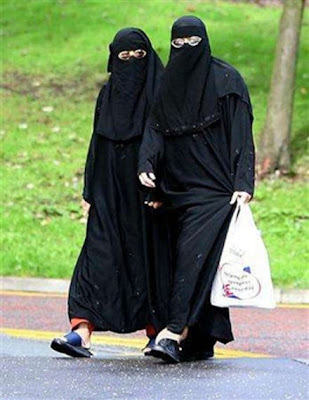 The burqa has been a hot issue in many European countries. Last month, the Italian spa resort town of Montegrotto Terme banned the burqa. A French MP has also proposed a ban on the wearing, sparking outcry among the Muslim minority and across the Muslim world. France, whose five million Muslims make up Europe's largest Islamic minority, banned Muslim headscarves in state schools in 2004 and a recent proposal for a burqa ban has sparked outcry in the Muslim world. Verily, we live in an age of miracles; thus, none other than Sheikh Mohammed Tantawi, the leading religious figure of Al-Azhar, was, just the other day, “reportedly angered” when he toured a school in Cairo and saw a girl wearing “niqab” which means that her face was masked or possibly that she was wearing a full head, face, and body covering. “Sheikh Tantawi, regarded by many as Egypt’s Imam and Sunni Islam’s foremost spiritual authority, asked the teenage girl to remove her veil saying: “The niqab is a tradition, it has no connection with religion.” The imam instructed the girl, a pupil at a secondary school in Cairo’s Madinet Nasr suburb, never to wear the niqab again and promised to issue a fatwa, or religious edict, against its use in schools. The ruling will not affect use of the hijab, the Islamic headscarf worn by most Muslim women in Egypt. Again, don’t rejoice too soon. Even the very influential Sheikh Tantawi has his fundamentalist detractors who have excoriated him for supporting France’s ban on hijab in public schools and for shaking hands with Israeli President Shimon Peres. And, clearly, the Egyptian government is unhappy about the gathering forces of Islamic fundamentalism which consistently manipulate women and women’s clothing as symbolic political statements. Some have even called for more severe Islamic clothing for women in which only one eye (Algerian style) can show. The Egyptian government understands that it is at risk vis a vis Islamic fundamentalists. A big Bravo! to Berlusconi and the Northern League for such bravery on this peculiar dress mode. Why live in Italy if you are a Muslim and continue to dress in 7Th century rags and follow in the footsteps of your male family members? Better they should leave and live in an Islamic country, much more comfortable for them as there is zero individuality amongst the sheep who follow this idiocy.